In the left sidebar of the documentation page is a quick search field; you can see it in Figure 1. 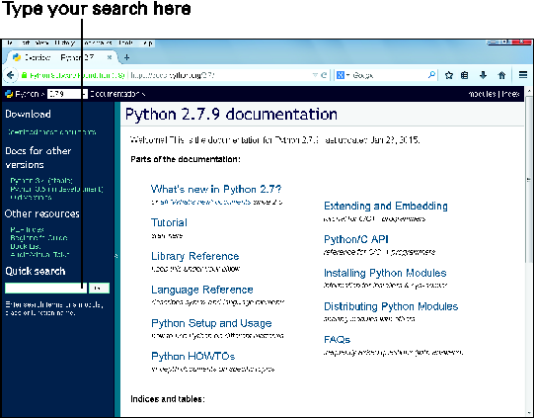 Type your question there and Python will search the documentation for you. It works better if you know the Python keyword, module, or error that you’re interested in. Figure 1: Python’s online documentation can help. The documentation shows the feature you looked for and a code template for how to use the feature. These docs have a lot of information, but they assume you know how programmers write documentation. This often makes them hard to understand. Reading the Python documentation is a skill that you have to master if you want to become a Python master. At the moment, though, don’t worry that it seems like it’s written in a foreign language. Just work through it slowly. As you read more of it, you’ll be able to get more information from it. Soon, docs you couldn’t understand at all will become mind-numbingly boring. Then you’ll know you’re making progress! The second form of help is Python’s introspection features. Introspection means that the program can tell you about itself. Introspection has a lot of different parts. You’ve already met one of them — the help feature. To understand the others you need to know more about Python, so I introduce the rest as you work your way through the book. “Professor Internet” is the third form of help. When you search the Internet, make sure you include Python as one of your search terms, followed by the thing you’re wondering about. If you know that it’s part of or related to something else, then include that other thing as a search term as well. For example, don’t search for print, because that’s too broad. Search instead for python print. (Capitalization won’t matter.). You use a different search strategy online from what you need for the interactive help. If ads are in your results, skip them. Source code is the final form of help. Keep in mind that Python is an interpreted language. This means that what you read is what the computer executes. As a result, if you want to know how some third-party module does something (the Python core isn’t written in Python, so that won’t help), you can literally look at it and see exactly how it did it. You won’t understand it at first, but no matter. Dive in. It starts making sense after a while.